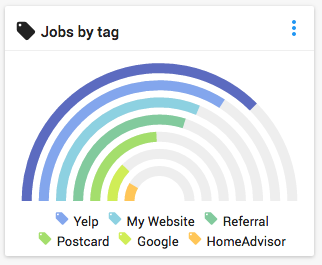 This dashboard will allow you to quickly see which job tags are attached to the most jobs. Job tags can be used to keep track of different aspects of a job. For example, a job can be tagged with a certain product name to indicate that a product was used when performing this job. A job can be tagged with a status such as "awaiting part" to indicate why the job is in its current state. A job can be tagged with a specific tag to indicate that an upsell was used as well.